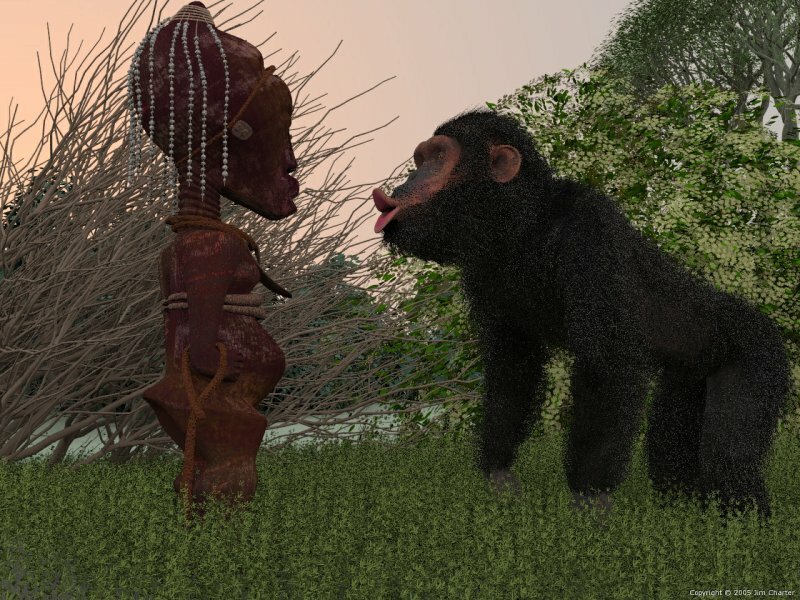 POVCOMP 2004: Viewing Page for "African Caprice"
Chimp-like primate and Songye power figure. 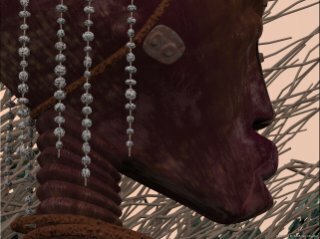 The picture's theme is at an intersection of personal interests revolving around depictions of sentience, cg character animation, abstract v mimetic art, evolution, and consciousness. It is a "caprice" in the sense that it juxtaposes elements without requiring that it be plausible necessarily. The two primary figures were modeled in Wings 3D, uvmapped in UVMapper, and converted to SDL mesh2 with Poseray. The texture maps were developed in Photoshop using texture references from www.imageafter.com. Use was made of customizable brushes. The ground and background foliage was developed in POV-Tree and Maketree. 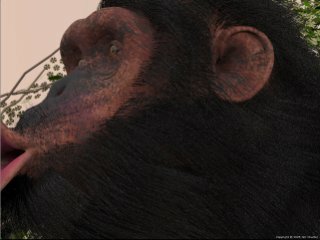 The hair on the primate is mesh generated in SDL. Instances were then applied in patches using vertex information which had been exported from Wings in .obj format, extracted from there with Python script, then used to define splines in SDL. The splines were then used to place and orient the hair. The sky is a hollow sphere with a cylindrical pigment pattern applied. Great concept, great modelling. The rendering, however, is ruined by poor lighting and above all awful antialiasing and graininess. I'm not sure what happened there, because there was the possibility of a great picture.